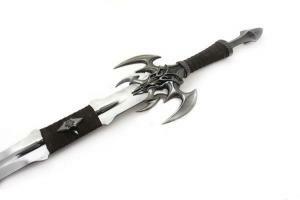 The sword of the Dark Elf Agnemmel, fierce war captain of the Dark One. Forged by Firaneth, the blade allowed Agnemmel to see into the future giving him great advantage in battle. The latest in the Swords of the Ancients collection! Exotath features a hand forged blade (false edged) of Damascus steel folded 256 times to 1792 layers for superior strength and flexibility. Exotath also features a leather wrapped blade grip, finely detailed cast metal hilt parts, and a genuine leather suede wrapped grip. This edition is strictly limited to 100 pieces worldwide. Each of these 100 Damascus Edition pieces is individually serial numbered to ensure authenticity, and includes a hand signed certificate of authenticity and art print.